Located directly on the white sandy beaches of Gulf Shores, Alabama surrounded by palm trees, The Hangout Music Festival treats their guests with plenty of music, sun, and sand! This year's lineup is stacked with CD102.5 artists including The Killers, Portugal. The Man, St. Vincent, AWOLNATION, Greta Van Fleet, and much more! What are you waiting for? Get your tickets today! The Hangout Music Festival is unlike any other. Watch performances by your favorite bands just steps from the Gulf of Mexico! Want to win the ultimate music vacation to the Hangout Music Festival plus a 3-night condo courtesy of Meyer Vacation Rentals – May 18-20, 2018? 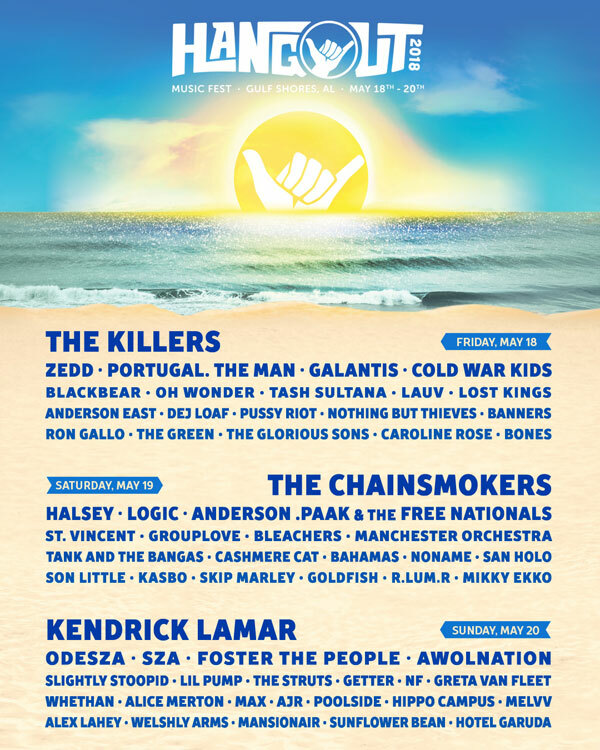 Then visit The CD102.5 Scene Team at various events around Columbus to get registered to win the Hangout Music Festival 2018 Prize Pack which includes a pair of weekend passes and a condo for three nights! *Grand prize winner will be chosen Friday, April 27th. Meyer Vacation Rentals offers a wide variety of vacation rentals in Gulf Shores, Orange Beach, Perdido Key & Fort Morgan including condos and beach houses – many of which are located on or near a shuttle route. Find the perfect condo for you and your friends here.